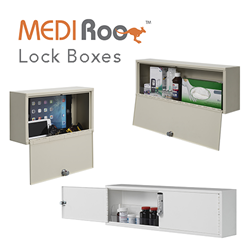 MEDIroo™ Lock Boxes securely store medication, supplies and patient belongings. MEDIroo™ Lock Boxes provide a turnkey solution to medical facilities’ efforts to improve patient satisfaction and healthcare efficiency. Carstens, Inc. is pleased to announce the release of their new line of MEDIroo™ Lock Boxes. These lock boxes are designed to secure medications, supplies and other treatment necessities at the point-of-care. They also aide decentralization distribution efforts, helping clinicians be more efficient. MEDIroo™ Lock Boxes are a space-efficient storage solution, perfect for patient rooms, pharmacies and nursing stations. They can be mounted on the wall or placed inside a locked cabinet, such as Carstens’ WALLAroo®, for narcotics storage. They can also be installed in patient rooms to secure patient and visitor belongings. The lock boxes come in three sizes: small, large, and dual door; each with the choice of a traditional key or a five-digit keypad lock. All three sizes are available in two neutral colors, almond and white. Constructed of durable, premium cold-rolled steel and featuring continuous hinges and anti-pry automatic locking doors, they are ideal for providing secure storage. MEDIroo™ Lock Boxes -- developed to provide a turnkey solution to medical facilities’ efforts to improve patient satisfaction and healthcare efficiency. MEDIroo™ Lock Boxes are available directly from Carstens. Visit their website http://www.carstens.com or call a customer service representative at 1.800.782.1524 for more information or to request a quote. Carstens is a leading provider of healthcare support products — serving thousands of medical and health facilities nationwide. From traditional patient record systems to electronic health record (EHR) support products, wall-mounted to mobile units, Carstens offers custom solutions designed to increase productivity and enhance interaction at the point-of-care. Carstens is a Certified Woman-Owned Small Business that manufactures all products in the USA at their headquarters in Chicago, IL. Carstens prides itself on being able to offer customers factory direct pricing and excellent customer service. Further information about Carstens, Inc. can be found at http://www.carstens.com.